The exact chained-rose thumb pattern appears on a number of other patterns in Selbuvotter. All this makes my nerdy little heart sing: historic mittens, glimpsed in the wild! (I’ll leave you to imagine the extent of the geek-out I inflicted on the alto section, and then on the tenors when I demanded my husband take pictures with his phone.) But let’s take a moment to appreciate that those mitts are EIGHTY YEARS OLD. 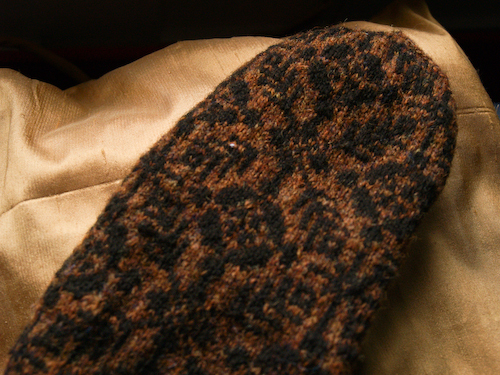 I noticed a little hole in one cuff and a bit of wear to the cast-on edge, but otherwise they’re in perfect condition. they are fab. and elizabeth z learned about steeking from some lady’s norwegian sweater. that is so much fun. 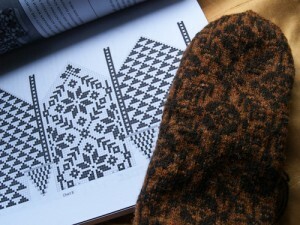 i have a little book with all these patterns by annechen sibbern bohn. you should get it if you ever come along it. there are some mighty pretty charts in it. i have an armenian student in my class now and i am dying to ask her if she knows anything about armenian knitting. call me crazy. Wow, 80 year old mittens. That’s incredible. And from your picture they look to be in great shape. What a great spot of a hand-knit in the wild! That is so awesome! They really look great too. How inspiring! that) the earlier examples usually are. Thanks for the photo! Catching up on your posts – your knits are so pretty! Happy 2009 to you! I can believe 80 year old mittens, as my Norwegian father still happily wears his 50 and 60 year old sweaters. One favorite lusekofte has finally given up the ghost after too many elbow patches, and I’m felting it into Christmas stockings next near. It’s gray and white, and I think I’ll add some sirdal braid at the top, and hopefully give that sweater another long life. Oh, wow, how neat to find mittens that old still being used and loved. 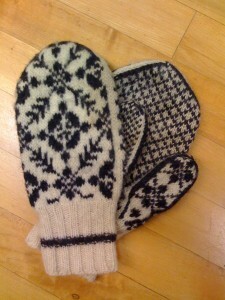 I absolutely love the Selbu-style mittens. 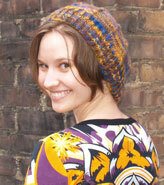 Sarah – its good to know I’m not the only person who notices other people’s handknits, has a (sometime!) inappropriate interest in them and takes pictures for posterity. My mom’s family is Icelandic – and old knitwear abounds there too. That’s terrific. I don’t think I have seen anything with quite as deep a history in my area, but I am always staring at everyone in their winter gear looking for the signs of handknits. How beautiful – visually and otherwise! I truly think that any sort of interest in history makes life a little richer. You can find history in every single moment of every day, and it changes perception marvelously. I hadn’t realized how much could be crammed into a pair of mittens! 80 years–that’s amazing! I’ve been a fan of Scandinavian mittens ever since making my first pair this summer. 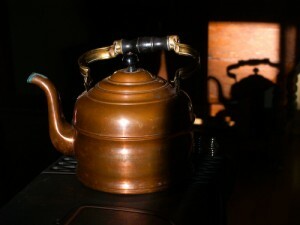 The color on your Trondelags is beautiful, just like a copper kettle–what yarn are you using? 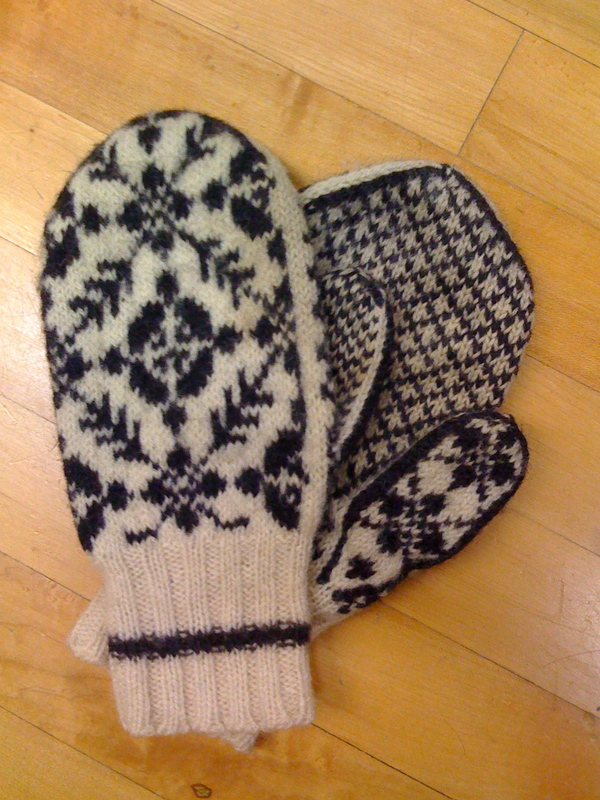 i saw that first picture and thought – “sarah knit selbu mittens!” i can’t believe those are eighty years old. i love the history and continuity. Weeellll, since it happened at CHOIR practice (itself kind of a niche activity, no?) I’m not sure how much the altos can complain about your geek-out. It’s just amazing to me that those mittens would last 80 years, and two wearers without being lost or mishandled in some way. Wow! I love those mittens! My own knitting skills are still in the beginner/intermediate range. Seeing things like that make me want to practice more and learn, learn, learn! What a find! I’d be snapping photos too. It’s extra-special when you see knits with a history like that. I bet the current owner will not look at those mittens in the same way again! I’d love to find some in my family, but I’m not sure Italians had much in the way of wool mittens, living near the Mediterranean. I do have some lovely crocheted pieces from one great grandmother. If you know of any places where I might find out about Italian knitting patterns, please let me know. aren’t mittens just THE project right now? man i love winter. oh yeah and the sweaters in the last post were gorgeous as well.